We continue our stroll through the McCartney archives with volumes 3 and 4: The third disc in the series is divided in two halves; the first part is dedicated to several interesting home recordings (and some not-so-interesting ones, 'Seaside Woman' seems to go on forever! ), while the latter part features various live recordings from their 1972 European summer/autumn tour. Highlights include the catchy 'Indeed I Do' with Linda on harmonies, spirited rehearsals of 'Give Ireland Back To The Irish', a lengthy live version of '1882', 'Best Friend', a track considered for inclusion on the unreleased 'Cold Cuts & Hot Hits' compilation, a great studio version of 'The Mess' that first appeared on one of the 'Unsurpassed Masters' CD's back in the mid-90's, the fantastic cover of 'Tragedy' - another 'Cold Cuts' song (why this was never issued amazes me) - the bouncy reggae of 'Seaside Woman', studio outtakes from the 'Red Rose Speedway' sessions in perfect master tape quality (also first issued on one of the 'Unsurpassed Masters' CD's) and several acoustic songs Macca performed during the making of the 'James Paul McCartney' TV special. As you'll notice, there are lots of gems on these two volumes. This is the third and fourth volumes of the fantastic 'MoMac's Hidden Tracks' CDR's issued in 2002. 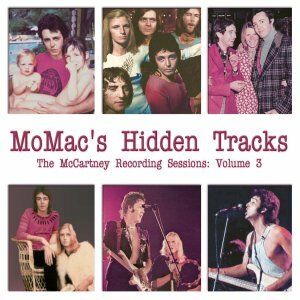 This mammoth collection gathers all available McCartney outtakes, including live cuts, demos and a few rarities in chronological order and from the best sources. MoMac's Hidden Tracks - Recording Sessions: Volume 3 0 out of 5 based on 0 ratings. 0 user reviews.